However, lending for acquisition, development and construction (AD&C) loans for home building purposes continues to decline. While a substantial part of the reduction since 2008 represents the write downs of bad loans, it is also the case that the drop reflects restrictive lending practices for emerging housing demand. According to Statistics of Banking data from the FDIC, the total stock of outstanding AD&C loans for 1-4 unit properties totaled $43.7 billion in the 1st quarter of 2012. This is 79% lower than the peak level of AD&C lending of $203.8 billion reached during the first quarter of 2008. However, the quarterly declines for AD&C lending have been slowing, and in the first quarter of 2012, the declines may have ended. The first quarter 2012 AD&C loan total was only 2.6% lower than the previous quarter, which in turn was 5.4% lower than the third quarter of 2011. Before mid-2011, quarterly declines averaged about 10%. The FDIC data reveal that the constriction of home building AD&C lending continues to exceed that of other construction loans. 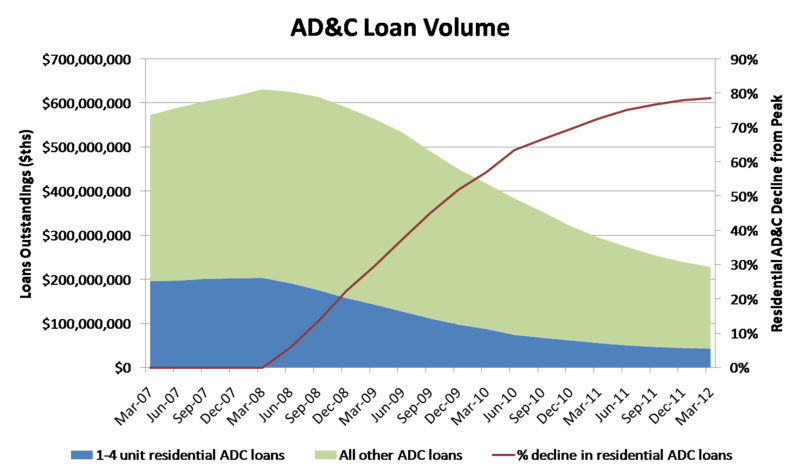 All other AD&C lending are off 57.9% from the peak, compared to the nearly 80% decline for home building. While consistent with NAHB surveys of home builders regarding the availability of credit, these data from the FDIC are somewhat at odds with the Senior Loan Office Survey reporting from the Federal Reserve. In general, the Fed survey data indicate that the days of credit tightening, as reported by lending institutions, ended some time ago. For example, the Fed survey results suggest that net tightening for home buyer mortgage lending generally ended in 2010, which is consistent with the FDIC data on total residential mortgage debt, which has been relatively flat over the last two years despite ongoing household balance sheet repair. However, the Fed survey data for commercial real estate lending indicate no net tightening since late 2010, a period when AD&C loans outstanding have declined, albeit for many reasons. More fundamentally, a lending gap continues to exist between home building demand and available credit. Since the beginning of 2007, the dollar value of single-family permitted construction has fallen 56%. During this same period, home building lending for AD&C purposes is down 79%. If we assume that the ratio of total AD&C lending to the value of housing permits at the beginning of 2007 reflected normal levels (total AD&C loans outstanding equaled 87% of permitted value), then a lending gap opened in the middle of 2010. Using the same benchmarks, total AD&C lending should be at least $40 billion higher to support today’s level of housing permits. 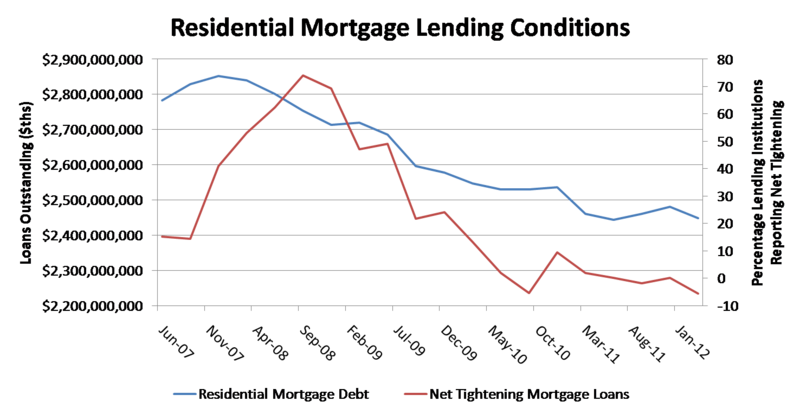 So while the declines in AD&C lending may be ending, lending conditions remain tight. And this lending gap is holding back home building from contributing to a robust economic recovery in areas where demand for new homes is growing.